Q. How can I make using headphones less fatiguing? I have been making music for years now, and although I have a set of Genelec 8040s that I use during the day (when I'm home), I have been using a set of Audio-Technica M50 headphones for writing at night, when I usually have the ideas and desire to write, but am unable to, due to neighbours and a sleeping wife.However, lately I have been unable to use the cans, as I've been experiencing discomfort and what I believe is the onset or warning signs of tinnitus. It's been a nightmare trying to adapt to not using cans at night, and I find it almost impossible to get anything other than sequencing done at this low volume!I'm wondering whether there are any miracle headphones or bits of kit that would minimise hearing damage or discomfort while still being (relatively) accurate and enjoyable to use. SOS Technical Editor Hugh Robjohns replies: Firstly, regarding the tinnitus: it's very common, often temporary and may be nothing to worry about. It can be brought on by something as simple as drinking too much coffee or suffering a mild ear infection, but don't ignore or neglect it. Go and see a medical professional and get checked out! If there is a problem, early intervention could make all the difference. I don't think there are any 'miracle' solutions in headphones. Basically, it comes down to self-control in establishing the most appropriate maximum level for those particular headphones and sticking to it. The simplest solution is to put a mark on the headphone volume control and exercise enough self-discipline to never turn it up past that. If you reach a stage in your mixing when you're finding that maximum level is too quiet, take a break. Give the ears a little time to relax and reset, and then start again. More volume is not the answer, though. It might seem more exciting and involving, but it doesn't really help to make better mixes — in fact, it usually makes them worse! The reason is that greater volume allows you to hear through a bad mix more easily, and poor balances aren't perceived as such. Working at more moderate levels — the kind of volume that most end listeners will use — encourages a far more critical approach to the mix, as poor balances sound obviously awful! Mixing becomes much harder, certainly, but also much more accurate and with far better end results. This is true of both speakers and headphones. By all means turn the volume up if you need to check low-level background noises and so on, but do so only briefly. Try to mix at a modest level, and keep that level fixed. If you continually change your monitoring level, your mix will change continually too! However, the fatigue you're experiencing may involve more than just sheer volume. The M50s are pretty good for the money, but I think you might find it easier to work with a pair of good open-backed headphones that are more revealing. You might find it helpful to read the comments and suggestions for different models in a headphone comparison article we ran in the January 2010 issue (/sos/jan10/articles/studioheadphones.htm). If possible, try different models before buying, to make sure the weight, headband pressure and size of the ear cups suit your head and are comfortable. Open-back headphones do 'leak' more sound than closed headphones, though, and that may be an issue for your wife! The M50, being a closed-back design, tends to be less revealing of mid-range detail than a good open-backed headphone, and a consequence of this is a natural tendency to keep cranking the level to try to hear further into the mix, but more volume still doesn't quite reveal what you want to hear! Headphones that exert a strong pressure on the sides of the head can also add to the sense of physical fatigue, and the sealed nature of the earpieces quickly makes your ears hot and uncomfortable, which also doesn't help. 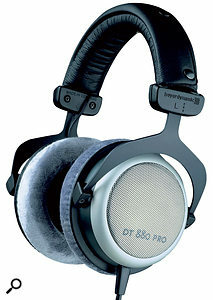 I'd recommend trying some good open-back headphones, like the AKG 702s, Sennheiser HD650s or the Beyerdynamic DT880 Pros. They are expensive, but I think you'll find it far easier to mix with them and you'll be much less tempted to wind the level up, although it is still very important to take frequent breaks to allow your perception of volume to reset! Headphones of this calibre provide a top-notch monitoring system that will last for decades if well looked after, and you'll probably hear all sorts of details that your Genelecs don't reveal, too. If you find that your closed-back headphones are quite fatiguing, it may be a good idea to try some open-back headphones, such as these AKG 702s. 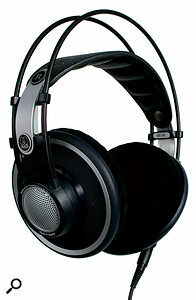 Decent open-back headphones are often more revealing than closed-back models, and may therefore reduce the temptation to increase the volume. Obviously, though, there is no physical sensation from the low frequencies when using headphones, as there is when using speakers and that can also be a factor in the continual desire to turn the level up, especially if you're producing music that demands strong bass content. The only way around that is self-discipline and learning to trust your headphones. As a last resort, if you don't think you have the self-discipline to leave the volume control alone, it might be wise to consider investing in a suitably calibrated headphone limiter. Again, it's an expensive option, but I'd suggest that it's well worth it to protect your priceless ears! There's some useful background information here: www.tonywoolf.co.uk/hp-limiters.htm. Also, Canford Audio offer various types of headphone level limiter that can be installed inside headphones or wired into the cable. These are based on a clever BBC design, which is now mandatory within the corporation to ensure that BBC staff don't expose themselves to excessive SPLs through their phones, and it works extremely well. You can read more about it here: www.canford.co.uk/technical/PDFs/EarphoneLimiters.pdf.